A public transportation agency said Monday it will closely look into the engine fires involving dozens of BMW vehicles with an aim to determine the exact cause by December. In a press conference held in Government Complex Sejong, 120 kilometers south of Seoul, the Korea Transportation Safety Authority (TS) said it has demanded additional documents involving recent vehicle fires and purchased three second-hand 520d sedans to conduct a set of tests to help explain the outbreak of fires in the engine compartments of certain models. TS plans to form a task force team with experts from universities and institutes and civil organizations to carry out the investigation, TS Director Kwon Byung-yoon said. "If we find BMW has scaled down or covered up the cause of fires involving its vehicles, we will immediately report it to the transport ministry," he said. TS is an organization under the Ministry of Land, Infrastructure and Transport. 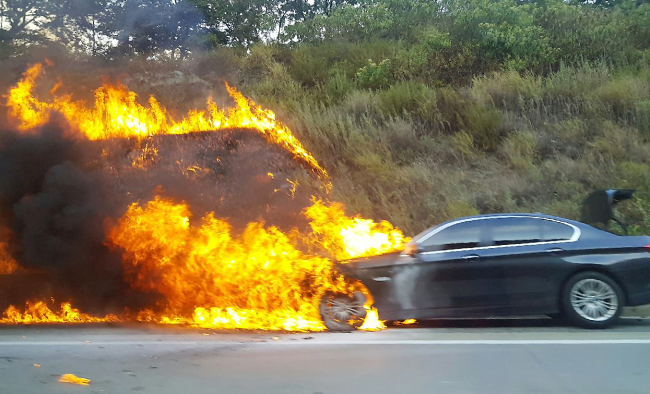 TS demanded BMW submit technology documents three times from June to July as an increasing number of BMW vehicles caught fire while being driven. But the German carmaker has not responded to the request or submitted documents which are lacking in some data related to the fire incidents, according to the agency. The documents requested by TS include BMW's own task force report on the cause of the fires, the exhaust gas recirculation maps of all BMW models and documents of engine compartment design changes, it said. TS has asked BMW to submit all the requested documents by Wednesday. BMW blamed the exhaust gas recirculation (EGR) component as the "root cause" of recent fires. A total of 41 fires in BMW cars have been reported so far this year. There have been no injuries or fatalities. Last month, BMW said it will recall 106,317 vehicles from Aug. 20 after completing an emergency safety check on the recalled models by Aug. 14. But the carmaker failed to finish the inspection and the transport ministry issued an order to suspend the operation of uninspected vehicles starting Aug. 15.